Social butterfly Sun in Libra and quietly dreamy Moon in Pisces make an odd mix. Libra will want to go out dancing, and Pisces will be overwhelmed by the music and people. But both these signs are in love with love, and if they can work through their different social preferences, this could be a beautifully romantic union. Sun in Libra thrives on relationships. Although having a romantic partnership is one of his goals, he also loves having a packed social calendar. 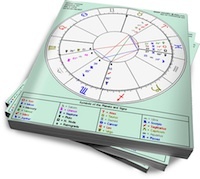 This Venus-ruled sign learns by observing how others react to him, so in order to grow, it’s essential that he interacts with a variety of people. But as his partner will learn, Sun in Libra prefers harmonious interactions at all costs. He’ll go out of his way to ensure that he’s perceived as gracious and charming. While this approach can lead to passive-aggressive tendencies (especially when he doesn’t express his true desires to his lover) it also means that he’ll make every effort to keep the romance alive in his relationship. Moon in Pisces needs quiet. This Neptune-ruled Moon always has one foot planted in the world of dreams, where she nurtures a private, exalted fantasy. She’s also a painfully empathetic partner, who will take on her lover’s needs as her own. But she’s so sensitive that she needs to withdraw from people (including her partner) on a regular basis. Moon in Pisces’ Shadow can involve drifting into depression, especially when she absorbs the pain of others or becomes disillusioned with reality. A sensitive partner (who is also able to keep her buoyed) suits her best. Sun in Libra may not initially understand his quiet, moody partner’s need for isolation. And Moon in Pisces will feel drained by Libra’s social agenda. But if there are other binding contacts between their charts, they can still make it work. Pisces will appreciate Libra’s light touch, plus his efforts to create a soothing place for her to retreat. When Libra discovers Pisces’ romantic fantasies, he’ll be inspired to bring them to life. Together, these two can create their own magical world where their dreams are embodied by each other.